The NHRA professional tour dazzled in-front of a nearly sold out Bandimere Speedway Friday night at the 39th running of the Dodge Mile High NHRA Nationals as Leah Pritchett (Top Fuel,) Courtney Force (Funny Car,) Greg Anderson (Pro Stock Car) and Eddie Krawiec (Pro Stock Bike) nabbed the top spots after the second qualifying session. Leah Pritchett stole the top spot away from Steve Torrence in Top Fuel with a stout 3.806 at 317 mph to end the second session of qualifying under the lights. Pritchett had a strong set-up after the first session with a 3.97 second pass. But knowing there was ‘more in it,’ the new look 1320 ‘angry bee’ dragster went after the drag strip, dropping low of the event for Don Schumacher racing. Pritchett has been involved in several side events at Bandimere this weekend. Title sponsored by Dodge, Pritchett has partaken in match races and the famed ‘block party,’ which happens in Golden annually the night before the Mile High Nationals. Pritchett also raced alongside Matt Hagan in brand new Dodge Demon’s to promote their new styles to Mopar and race fan enthusiasts. 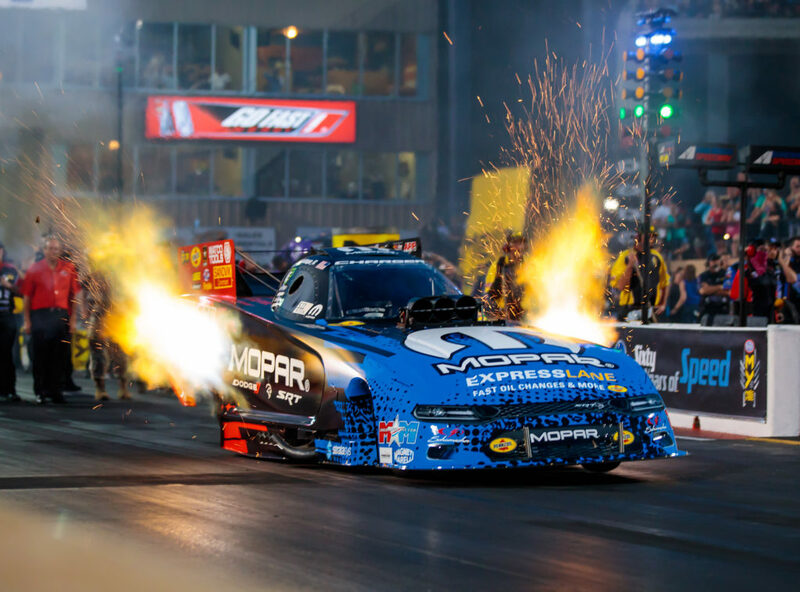 In funny car, Force has dominated the way in 2018 and did so once more on ‘Thunder Mountain.’ Force came into Denver to start the ‘Western Swing’ — a three race, three week run around the western side of the United States — as the points leader in the category by a full couple rounds. In the first sessions, the fireworks were provided early from Cruz Pedregon when his brand new Snap-On Tools funny car exploded halfway down the race track, sending the body flying in the air. But before the nitro-methane powered dragsters and funny cars hit the drag strip, the door slammers hit the quarter-mile and were led by Summit Racing’s Greg Anderson. Anderson dropped low of the night, 6.933 at 197 mph on his first qualifying session to lead the pack after Friday night. Local pro stock car driver Deric Kramer from Sterling, Colo in his American Ethanol Chevy Camaro would follow closely behind Anderson, dropping his factory hot rod only two-thousands short of the top spot at 6.935 in the quarter-mile. The Harley of Eddie Krawiec would rumble past all in pro stock bike, who went 186 mph on two wheels at 7.132 to take the top night after the second session. At 9000+ ft density altitude, drag racing can be a challenge to many of the bracket and professional racers. But crew chiefs turn up the heat and spin motors to the limit to push their race cars to the top. Top Fuel dragsters are known as one of the fastest accelerating man-made vehicles on the planet, even faster than NASA’s space shuttles. The racing at Bandimere Speedway continues tomorrow with two more sessions of qualifying on Saturday before the professionals go into eliminations on Sunday. Tickets are still available and can be purchased by clicking here.